It’s the birth date of Padraic Colum (1881–1972), The Children's Homer, and James Thurber (1894–1961), Many Moons, The 13 Clocks. It’s also the birthday of Roman lyric poet Horace (65–8 B.C.) Read Horace by Holly Keller and Horace and Morris but Mostly Dolores by James Howe, illustrated by Amy Walrod. The first acknowledgment on national television that women sometimes are pregnant occurs on an episode of I Love Lucy in 1952. Read It’s So Amazing! by Robie H. Harris, illustrated by Michael Emberley and Where Did That Baby Come From? By Debi Gliori. December has been designated Read a New Book month. My offering for the Almanac today, first published in 1992, has just been updated and rereleased by Johns Hopkins University Press. 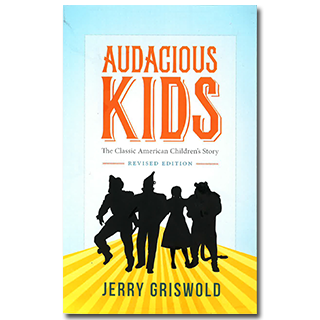 Although I know a handful of my readers picked up Jerry Griswold’s critical examination of some of our great American classics, Audacious Kids, I offer up this new edition with the knowledge that many have not found it. Even though I read this book over twenty years ago, because of the richness and complexity of Jerry Griswold’s critical analysis, it constantly surprised and delighted me on rereading. When the book was released, Jerry formed part of the brain trust at San Diego State University and served there as the director of the National Center for the Study of Children’s Literature. He contributed fascinating articles about children’s books to Paris Review and continually elevated the discussion of great books for children. In the essays gathered in Audacious Kids he explores some of the great 19th and early 20th century works from the Golden Age of children’s books—from the Civil War to World War I—The Wizard of Ox, Adventures of Huckleberry Finn, Little Women, The Secret Garden, and Rebecca of Sunnybrook Farm. In these seemingly unique titles, Jerry shows their similarities—how an orphaned child, who makes a journey, is adopted by and put upon by adults but ultimately triumphs. What distinguishes these essays, and what has always marked Jerry’s prose, is his ability to write scholarly analysis that is readable, enjoyable, and clear. He never finds a need to obscure faulty thinking with impenetrable language. When I came into the children’s book many years ago, I asked, “Where was the Edmund Wilson of children’s books?” Throughout his career Jerry has adhered to the Wilson model of crating fascinating and readable criticism. A short history of American Children’s Literature has been added to the new edition and anyone hunting for a text for a college courses should give this handsome paperback serious consideration. But for me the real audience remains those like me who love children’s books, appreciate critics who understand them, and delight in reading well-crafted and thoughtful essays about them. So for readers of the Almanac, if you want to revel in children’s books over the holidays, give yourself a treat and pick up Audacious Kids. You will feel in the end like you have been guided through this literature by a brilliant professor. Reading this book again, I am so grateful for all Jerry Griswold has given the field in his columns and books. Our great books and writers for children deserve the thoughtful and lucid analysis that he has always provided. What cannot be ignored is how much the land of Oz is a reflection of actual circumstances in the United States at the turn of the century. At that time, America must have appeared a kind of fairyland to foreigners and natives alike. As impossible as it might seem, in America, as in fairyland, any boy could become president of the country. As if by some lucky spell, fortunes could be and were made overnight. Merchant princes of the Gilded Age built or bought castles for their private homes. P.T. Barnum, as much a master of hokum as Baum’s Wizard, was a national hero. Immigrants believed that the streets were paved with gold, only to discover, perhaps, that they were really made with yellow bricks. Originally posted December 8, 2014. Updated for . Somehow, I’ve never encountered this book! Looks like a good one!! I need to get my hands on it. I appreciate when people identify the importance of literature in general, but my ear especially perk up when someone pays attention to children’s books…so much of our world at large reflected in them.